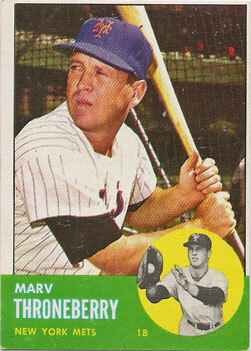 Today’s Mets card of the moment is from the 1963 Topps set (the inspiration for this year’s Topps Heritage design) and features legendary Mets first baseman Marv Throneberry. While most baseball legends earn their reputation with skill, Throneberry’s legend seems to be based on a distinct lack of it. The most famous “Marvelous Marv” story has him hitting a would-be triple, only to be called out for failing to touch second base. When Casey Stengel went out to argue, his first base coach told him not to bother because Throneberry had missed first base, too. Does anybody have any other stories to share? You can keep up with Paul’s Random Baseball Stuff through Facebook, Google+, and Twitter.